In an official response filed on Thursday, the University denied effectively all of the Pearson family’s allegations in their ongoing lawsuit against the University. This is the latest development in an ongoing dispute over Thomas and Timothy Pearson’s $100 million donation to create an institute to study global conflicts at the Harris School. The Pearsons claim that the University has mismanaged the institute, which was announced in 2015. In its response, the University said it is in full compliance with its grant agreement and claimed the Pearsons consented to many of the actions their complaint cites. The University also countersued the Pearsons, alleging that their refusal to pay a $13 million installment due on June 30, 2017 amounted to defaulting on the agreement. The April 2015 grant agreement, included as evidence by both sides, provides a rare glimpse into the conditions attached to large university gifts. Six pages of the agreement cover plans for the gift’s announcement event in September 2015, including a maximum budget of up to $1 million, paid using the University’s own funds. A hypothetical list of potential panelists for the event includes Henry Kissinger, Tony Blair, Steven Spielberg, and Elie Wiesel, who passed away in 2016. Another section details international news outlets to be contacted about the event, including Al Jazeera, Le Monde, Sky TV, and Reuters. The agreement details plans to give a New York Times reporter advance notice of the event in order to secure coverage. On the merits, the Pearsons’ case may come down to whether the University was in default as of June 2017. That was when the Pearsons refused to make a $13 million payment by its agreed deadline, and told the University that it had breached the contract by failing to hire an institute director or create a satisfactory budget. 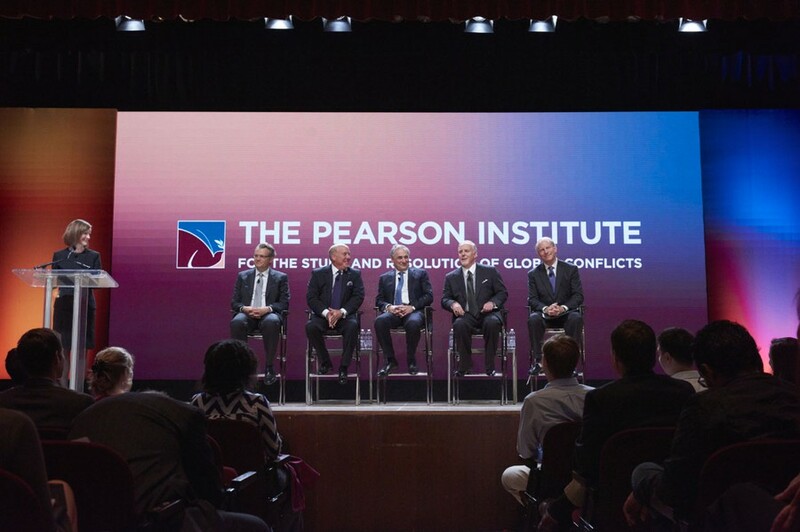 The Pearsons’ complaint includes other alleged violations, such as hiring insufficiently qualified faculty and the University’s refusal to host the Pearson Global Forum by its original planned date, which is this October. But if the Pearsons are unable to prove the University was already in default by June 2017, their refusal to pay could provide legal cover for any grant obligations the University did not fulfill afterward. One key question is whether the University appointed an appropriate director for the Institute. The Pearsons claim that professor James Robinson, who runs the Institute, is a 'faculty director,' whose research and teaching obligations prevent him from managing administrative operations. They say the University was obligated to hire a separate institute director who would handle those responsibilities. The University claims that the institute director and faculty director were always understood to be the same. The grant agreement uses both "faculty director" and "institute director" to refer to the same person. In addition, it says the director should hold the Reverend Dr. Richard L. Pearson Professorship, the chair which Robinson occupies. If the University wins its countersuit, it’s not clear what the consequences would be for the Pearson Institute, although the University has expressed commitment to continuing its work. According to internal University communications from last summer, the University believes that a default by the Pearsons absolves it from any obligation to sustain the Institute with University funds and entitles it to remove the Pearson name. In a statement, University spokesperson Jeremy Manier reaffirmed the University’s commitment to uphold the grant agreement. This article has been edited to clarify that the University denies being in default at any point, including after the Pearsons refused to pay in June 2017.